Find answers to your Osmocote® questions by clicking on an item below. Which Osmocote® formula should I use? Can Osmocote® be used with edible plants such as vegetables, fruits and citrus? Yes. In fact, Osmocote® Flower & Vegetable Plant Food is formulated for just these purposes. Each granule contains essential plant nutrients such as nitrogen, phosphorous and potassium. Nutrition is released into the soil slowly so that plants have a ready supply as they grow. Osmocote® granules are coated with a resin made from vegetable oil, which make them safe to handle with bare skin. Of course, it is always wise to wash hands following exposure to any garden product and it is also best to avoid ingesting granules directly or touching eyes after granules are handled. Can Osmocote® be used to prolong the life of cut flowers? display cut flowers away from heat during the day (that is, avoid windows, TV’s and other electronic devices, radiators, kitchen stove, etc.). Can Osmocote® be used with all varieties of potted plants? Yes. 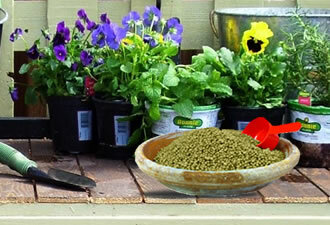 Osmocote® can be used on all varieties of potted plants. Apply as directed for best results. How do I apply Osmocote®? How much do I use? How often should Osmocote® be applied? Osmocote® Outdoor & Indoor Plus should be applied every 6 months. Osmocote Flower & Vegetable® should be applied every 4 months. Should Osmocote® be used with water? It’s important that Osmocote® be applied dry. Do not pre-mix the product with water before applying. Further, it’s not necessary to water plants immediately after Osmocote® is added in order to reduce the potential for chemical “burn.” Osmocote® has a resin coating that encapsulates the nutrients. Direct contact by the product with plants is not a problem. What is the best time to apply Osmocote®? One of the nice features of Osmocote® is that it can be applied just about any time. Early spring is always a good time to start the feeding process as long as the ground is not frozen. It’s best to work product into the top 1-3 inches of soil or mulch, but even when that’s not possible, the melting of late snow and/or early spring rains will work the granules into the soil. As ambient temperatures begin to climb, so, too, will soil temperatures. The release of nutrients from the Osmocote granules will track the steady rise in soil temperatures thus ensuring that the right amount of nutrition is available when plants are able to use it. 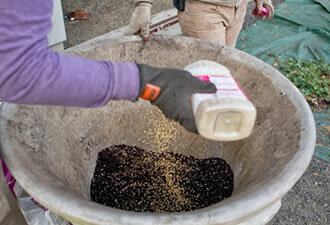 It’s as simple as spreading the recommended amount and mixing into the soil. Please refer to the FAQs for more information. What is the effect of Osmocote® on the environment? Osmocote® is a manufactured product — meaning, essential plant nutrients are formed into individual granules then encapsulated so that nutritional release can be controlled to fit the pattern of nutrient uptake in the plant that it feeds. 1) plants will not be overfed (that is, “burned”) and 2) overwatering or heavy rainfall will limit washing away of nutrients into streams and lakes. What is the shelf life of Osmocote®? Osmocote® granules can last for as much as eight (8) years when stored properly. Proper storage means being in a relatively cool but dry place. If granules get wet (either from water or high humidity) or high temperatures, they may begin to release some of their nutrients and the remaining product may become less effective when it is finally applied. How does Osmocote® differ from other slow-release plant foods? Compared to the top selling brand of slow-release plant food, Osmocote® contains almost 2X the amount of slow-release nitrogen per pound of product. Osmocote® granules are nearly perfect spheres and uniform in size. This ensures that nutrient release works the same way with each granule and contributes to the consistency of the nutrient release. Osmocote® has a resin coating, a characteristic that’s somewhat elastic. This reduces the risk of the granules cracking and inadvertently releasing nutrients during the packaging process or when the product is in transit to the retail store. Click here to see the analysis of the Osmocote® products! What’s the difference between ‘consumer’ Osmocote® and the Osmocote® product used by professionals? Osmocote® for consumers and Osmocote® for professional growers utilize the same technology. Both products use the same prills (granules) and the same unique resin coating. In fact, these products are manufactured in the same plant in Charleston, South Carolina. While the consumer product is available in just two formulas, the professional product is produced in nearly 50 formulas because professionals require a broader range of NPK analyses depending upon the crop they are growing and local growing conditions. 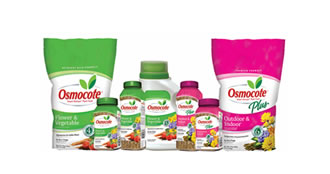 Osmocote® for consumers is available in four sizes, 1-lbs and 2-lb. bottles (O&I and F&V), 4.5-lb. shaker bottle (F&V) and 8-lb. bags (O&I and F&V). Osmocote® for professionals is packaged in 50-lb. sacks. Do plants receive nutrients immediately after application? No, which is the point of a slow-release plant food. Instead, Osmocote® nutrients are released into the soil as replacements for the nutrients being drawn into the plant’s root system. The temperature of the soil controls the rate at which nutrients are taken up by the plant and the rate at which nutrients are released by the Osmocote® granules. The warmer the soil, the faster nutrients are released. Conversely, when soil temperatures drop, so does the release of nutrients. How does Osmocote® react with other fertilizers or plant food products? Professional growers frequently use a water-soluble fertilizer in addition to Osmocote®. Water-soluble fertilizer is absorbed partially through the leaves (foliar feeding). This compliments the root-feeding properties of Osmocote®. When using a water-soluble product with Osmocote, be sure to follow the recommended rate on its package but then cut that amount by half. Typically, a water-soluble fertilizer has a roughly two-week impact on the plant, but meanwhile, Osmocote continues goes right on feeding for up to four (4) months! No, Osmocote® does not contain staining agents. How should Osmocote® be stored? The product should be stored in a cool, dry place. When the product is exposed to moisture or high temperatures, nutrient release could begin making the product less effective when eventually applied. Is Osmocote® harmful to animals? Osmocote® is not harmful to animals when used as directed. What are the yellow and white shells that are left over after application? Sometimes the spent shells are mistaken for product that failed to activate and release nutrients. These shells are actually empty and are residual material. After osmosis occurs and all of the nutrients are released, the remaining granule is empty. These shells will eventually disintegrate into the soil. Does Osmocote® have an odor? Because of its unique resin coating, Osmocote® does not have an offensive odor. The ingredients in this product are as natural as the first 92 elements in the periodic table. A plant does not distinguish between nitrogen from chicken manure versus nitrogen from natural gas. Nitrogen is nitrogen. Nitrogen from Osmocote® has limited leeching, even after it is exposed to heavy rainfall or overwatering. There is no problem in reconciling the desire to protect the planet and the use of a product that uses nutrients that are already part of the core universe and are measured in their application. Osmocote granules are nearly perfect spheres and uniform in size to ensure consistent release. Please refer to the FAQs for more information. Where can Osmocote® be purchased? Osmocote® is a good value. What consumers are buying is slow-release nitrogen. The amount of slow-release nitrogen is critical to plant food performance (it almost always drives plant growth). On a price per pound for slow-release nitrogen basis, Osmocote® is competitively priced. In other words, you get what you pay for!